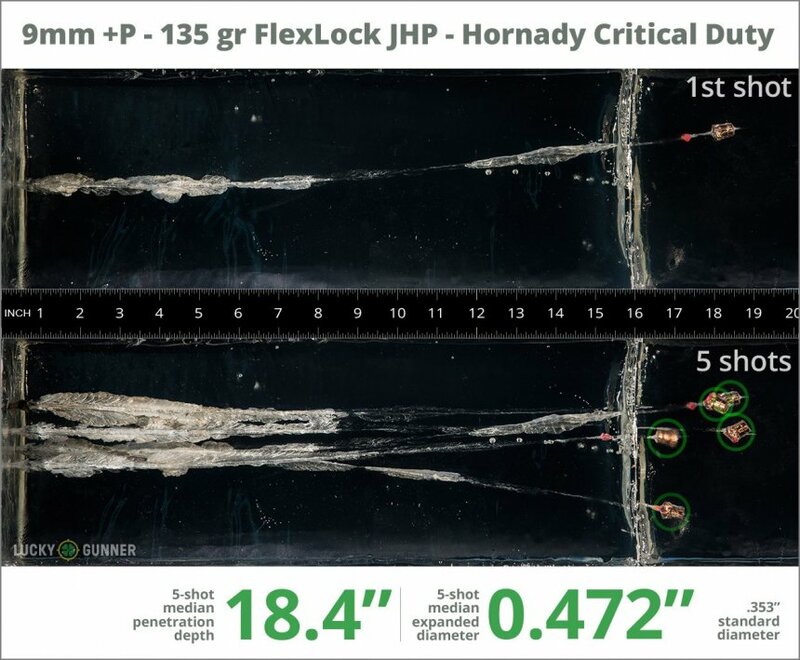 Ballistic gelatin testing is one way to get an idea of how a self-defense load might perform in a real world self-defense situation. 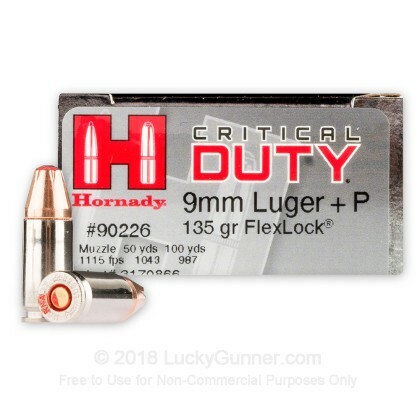 So we fired five rounds of Hornady 135 Critical Duty +P from a Smith & Wesson M&P9C from a distance of 10 feet into a block of synthetic ballistic gel with a barrier of four layers of fabric simulating heavy clothing. We then gathered information on the expansion and penetration characteristics of this load. That data is represented in the chart below. 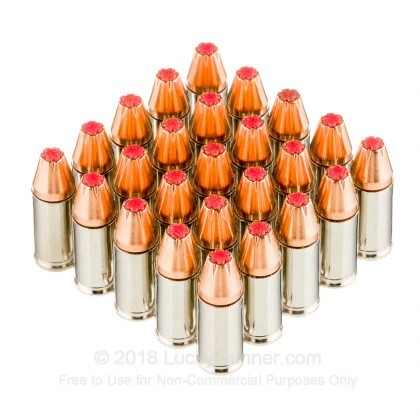 How this load compares to other 9mm Luger (9x19) loads from our tests in regards to bullet expansion and penetration can be found in the diagrams at the bottom of the page. 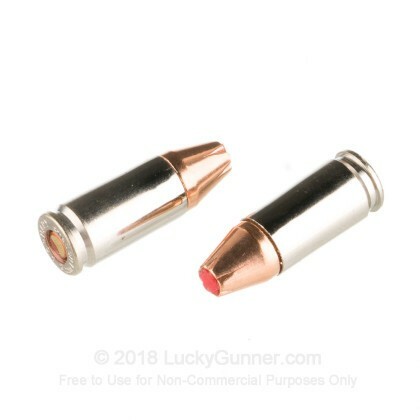 0.90" This ammo: 0.47" Min: 0.32" Median: 0.50" Max: 0.90"
18.4" 0" 5.6" 17.7" 47.5" This ammo: 18.4" Min: 5.6" Median: 17.7" Max: 47.5"
This is the best ammunition for everyday carry! I know when I pull the trigger whatever is I am pointing at will no longer be there! 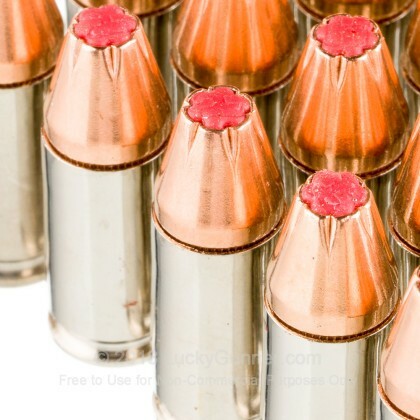 These could stop a fat chick chasing after a muffin!!! 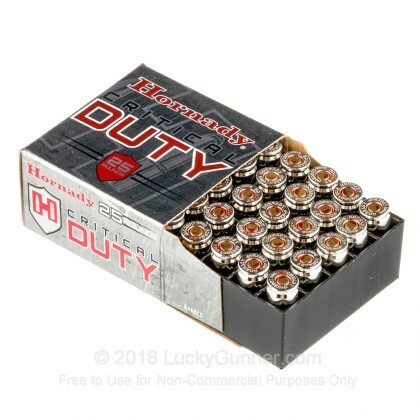 Best price including shipping from Internet search programs. Super fast delivery. Orders arrived within a week. It doesn't get any better. 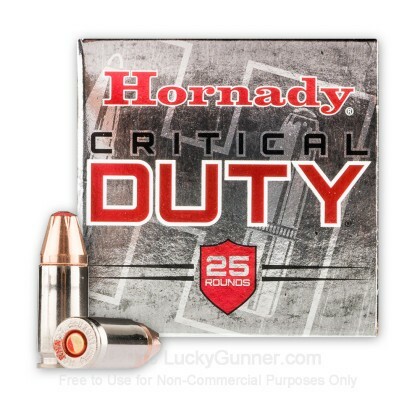 We also have this 9mm - +P - 135 gr FlexLock JHP - Critical Duty - Hornady - 25 Rounds ammo in stock in a smaller quantity.